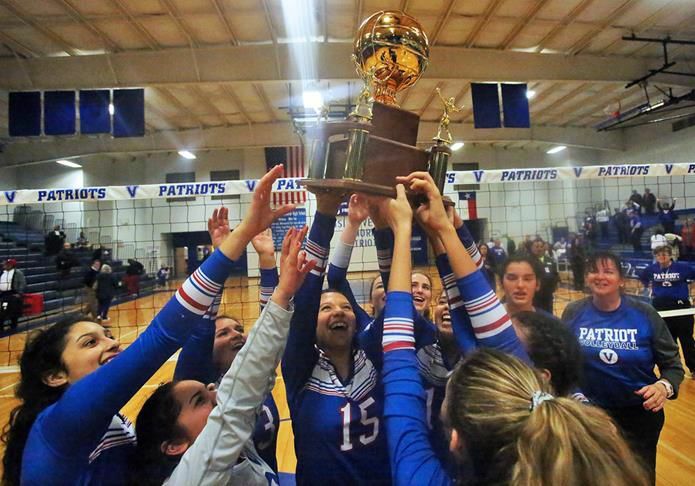 Mission Veterans team members hold the district championship trophy over their heads after defeating Roma and claiming the District 31-5A title at Mission Veterans Memorial High School on Tuesday, Oct. 23, 2018, in Mission. The 2018 season has already been full of honors, accolades and milestones for the Mission Veterans Patriots. On Tuesday night in Mission, they had one final task to put a bow on the regular season — perfection. With a 25-6, 25-4, 25-14 sweep of Roma, Vets completed its fourth straight undefeated district season. That’s four straight clean district campaigns for Makenzie Gerlach and Jackie Howell, who have played on varsity all four years of high school.